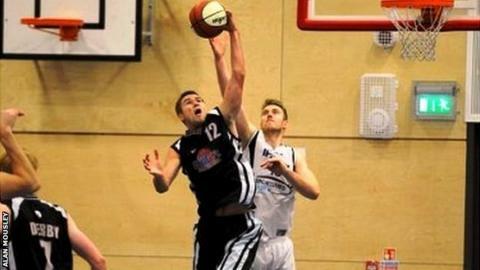 Derby Trailblazers forward Alex Dorr says their record against Ipswich has heightened anticipation for Sunday's England Basketball League Division Two play-off final in Manchester. Ipswich have beaten Derby on two of their three meetings this season. "I've never been so excited and ready to play, especially against Ipswich, who have gotten us twice this year," Dorr told BBC Radio Derby. "We have been playing at an entirely different level this last month." The American continued: "I have been enjoying basketball more than I have in a long time. "As I step out onto the court for the game, it will be the moment I visualized as I started my journey here this year and I just hope our unselfish style of offensive play and tenacity on defence can continue on Sunday. "As far as Ipswich's biggest threats are concerned, I think their size in general has seemed to bother us so we need to be scrappy with rebounds and not rush our shots. "If we contain Tom Sadler's outside shooting, contain Josh Johnson's aggressiveness and limit Leigh Greenan close to the basket, we will put ourselves in a good position to enjoy the result in the end." The approach has served them well to date, clinching the league crown with a game to spare last month. Dorr, who has combined studying at the University of Derby with playing for both the Trailblazers and the university team, said the Division Two decider would be an emotional experience for him. "The bitter part comes about because I know it will be the last time I take the floor with the squad this season to compete," said Dorr. Trailblazers assistant coach Steve Baxter said the final is a chance for them to stamp their authority, having been relegated last season. "We have already achieved one of our goals by winning the league and in doing so proving we were the best team in the division over the course of the season," said Baxter. "We now need to replicate the form we have been in since Christmas and produce the goods one more time. "With ten straight wins behind us compared to Ipswich's seven, there's no doubt we are the form team, but I still feel there is so much more to come from us." Dorr, team-mate Simon Allaway and Derby Trailblazers head coach James Maudsley will be talking to Ian Skye on BBC Radio Derby from 18:15 BST on Thursday, 24 April.